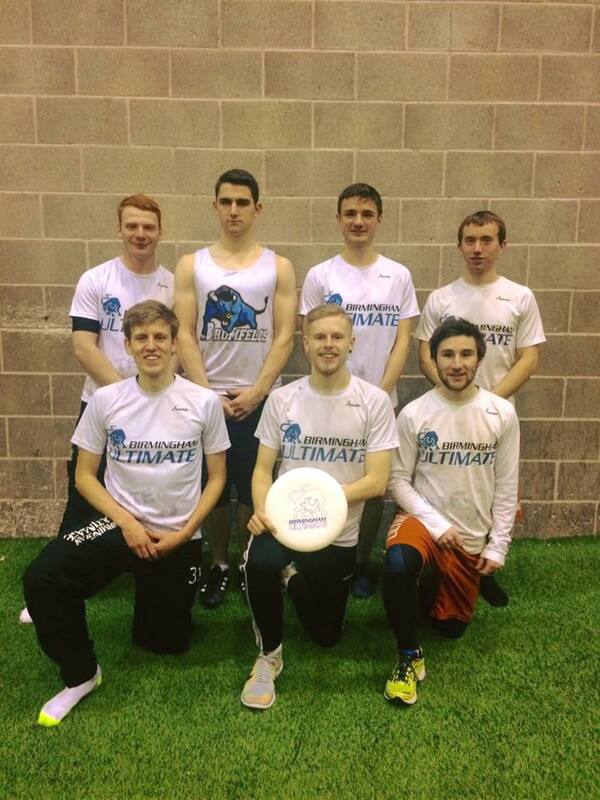 Indoor regionals came along quick this year, with little preparation time as a team playing on the bigger pitches in Coventry was going to be a challenge – especially with only 6 of us on Saturday. Initial estimates were that the top 6 finishers would qualify for Nationals; we came in seeded 4th after our decent showing at Nats last year. That meant we had been handed an “afternoon” slot in the schedule and some tough looking groups! We started the weekend at about half 4 on the Saturday afternoon and it took us a little while to work out what was going on. Unfortunately our first opponents, Prone, did not let us have any time to adjust and came out fighting, the game went down to the wire but we just about pulled through to take the win 7-5. Despite only playing one game, we then had a big gap until our second one against The Butterfield All Stars. When it finally rolled around we had to get our legs going once more, and again things went right down to the wire. After some confusion it turns out that we got the cap rules wrong – we actually scored too early! That gave them a chance to even the score, and they gleefully took it, hitting their deep threat just before the buzzer to claim a 6-6 draw and deny us a chance to reply. By this time we’d got used to playing in the dark and started well against LED 2, we took a commanding lead and controlled the game to take an 11-4 win. Next up was Sink or Swan, the grad team from Swansea Uni. Despite the fact that they haven’t played together all that much, they’d spent the day getting their game going and really took it to us. Even though we got a lead at the start, they used their height advantage well and made it really tight towards the end. We only just managed to hold them off, 8-7. Before our final game we were informed that the Purple Cobras team we were slated to play had been reduced to 4 people (because it was like 9pm…) and wanted to forfeit the game. An intense rock-paper-scissors battle ensued to decide if the forfeit score would be 9 or 10 nil. We lost, and had to settle for 9-0. All those results meant that we topped the pool and maintained our 4th seed overnight. The real upside of the 9-0 default was we got to leave early, although it was still probably about 9.20pm by time we actually made it to the cars. After a nights rest and with an extra pair of legs on Sunday, we went into the first game against Lemmings knowing that a win would see us into the top 4 and secure a spot at Nationals. The game was tight to begin with and everything was hard fought, but we slowly started to take control and got the break to make it 5-3. We continued trading until 7-5, but after they scored to make it 7-6, we turned over with about 30 seconds left. Our defence held firm though and we eventually got the crucial turnover as the sound of the buzzer caused some confusion. From there we managed to put in the all important score to take the game 8-6, and with it a spot at Nationals! The semi-final was another tough matchup against S&L Cartel. In both of the last two years we’d faced them in the regional final and been soundly beaten both times. Unfortunately this time around was no different, they took the lead early and never looked back. Again we made a game of it once we were down, but it was too little too late and they took it 10-5. In the 3v4 then we had a bit of a point to prove and it showed as we came out and played our best Frisbee of the weekend against LED 1. For the first time we really took a game by the scruff of the neck and pulled out to an 8-4 win. It was a bit of a shame we waited so long to play this kind of game because there was no one left to see it by this point! Either way, that is both the style and the mentality we want to take to Glasgow for Nationals in February! The full results from regionals can be found here.